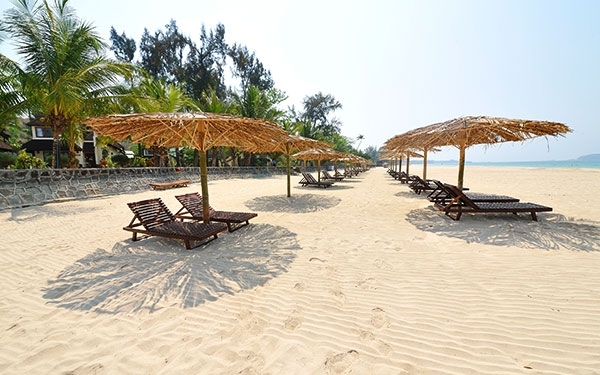 Jade Marina Hotel stretches along the shoreline of Ngapali beach that boasts 3 km of palm-fringed sands on the beautiful Bay of Bengal. The turquoise water delivers a bounty from the sea and this town serves up some of the country's best sea food. Located 7 kilometres from the town of Thandwe, in Rakhine State, Myanmar and it is the one of the most famous beaches in South East Asia attracting thousands of tourists every year and popular amongst tourists as an unspoiled and private beach. Jade Marina Hotel also provides the quality services combining the breathtaking beauty of unspoiled nature with a sophisticated contemporary design born from the encounter between traditional forms and highly creative style. The quality of the services along with the views of the sea offered by its magnificent position is the perfect introduction to the second luxury property from Jade Marina Hotel. the Bay of Bengal with the 5 star hotel services. A luxurious and spacious two storeys Private Villa with a surface of 1417 Square feet, will give you a whole new Ocean view experience. The corner suite rooms offer balmy breezes by day, a full canopy of stars by night,luxuriate in complete comfort and privacy. of today's luxuries at Jade Marina.